(Nanowerk Spotlight) In the decades-old quest to build artificial muscles, many materials have been investigated with regard to their suitability for actuator application (actuation is the ability of a material to reversibly change dimensions under the influence of various stimuli). One research team for instance reported high-performance artificial muscles from spider silk that can be powered by humidity only. Other efforts led to the discovery of the electromechanical actuation properties of single-walled carbon nanotubes and the complex behavior of multi-walled carbon nanotubes has led to the development of various carbon nanotube actuators (see "Carbon nanotube/biopolymer composites show promise as artificial muscles"). Besides artificial muscles, potential applications include microelectro-mechanical systems (MEMS), biomimetic micro-and nanorobots, and micro- and nanofluidic devices. However, while quite capable, the explored materials can not still surpass the performance range available from natural muscles. "Recently, hope in obtaining improved artificial muscles was revitalized by the discovery of the extraordinary mechanical and electrical properties of graphene and its chemical derivatives,"Mikhail Kozlov tells Nanowerk. Kozlov is a Research Scientist at the NanoTech Institute, University of Texas at Dallas. Last year we reported on his work in developing stretchy and conductive nanocomposite materials for robot skin and strain sensors. His research also includes work on nanostructured materials for high performance supercapacitors and carbon nanotube sound generation. In new work, the team from the UTD NanoTech Institute, Institute consisting of Jiyoung Oh, Mikhail Kozlov, Javier Carretero-González, Elizabeth Castillo-Martínez and Ray Baughman, built on a previous discovery that showed that graphene can provide actuation. Reporting their findings in the March 21, 2011 edition of Chemical Physics Letters ("Thermal actuation of graphene oxide nanoribbon mats"), the team's study adds to the list of advanced properties available from graphene oxide nanoribbons quite impressive actuator performance. Specifically, the study shows that electrical heating of graphene oxide nanoribbons mats results in reversible generation of 1.6% stress and maximum work capacity of about 40 J/kg, which is similar to that of natural muscle. "Dimensional changes in graphene and graphene oxide induced by various stimuli have been reported in the literature," explains Kozlov. "These studies evidenced good potential of the material but did not quite reveal the key for reaching high actuator performance. In order to address the performance issues we prepared and tested graphene oxide nanoribbon mats as tensile actuators." Unlike previous studies, the UTD team obtained the material by chemical unzipping of multi-walled carbon nanotubes. This method provided quite narrow graphene oxide nanoribbon that have more uniform size distribution than conventional graphene oxide flakes. The actuator performance of prepared mats was directly evaluated using electrical heating at ambient conditions. Such controlled heating avoided the reduction of graphene oxide to graphene and corresponding irreversibility in actuator stroke, which can occur at high temperatures. According to the published paper, the generated strain for prepared mats was almost constant over the wide range of applied stresses. The latter was limited only by the strength of graphene oxide nanoribbon sample that was ruptured at high sample load. "The lack of deterioration of the material performance in the high stresses region is rare for actuators" the authors report. "It shows that the internal forces responsible for the strain generation substantially exceed the applied external stress." The researchers associated the observed dimensional changes with the adsorption/desorption of water molecules by the highly hydrophilic graphene oxide nanoribbons. They expect that the alignment of nanoribbons in the sample and the increase of the mat strength can substantially increase both generated strain and work capacity. Kozlov notes that these novel thermally-driven graphene oxide nanoribbon actuators expand the family of materials that can be deployed as artificial muscles. "In our experiments, graphene oxide nanoribbon mats provided promising actuator strain and work capacity comparable with those of many electrochemically-driven systems. After optimization of the structure and mechanical properties, graphene oxide nanoribbon actuators might be able to challenge the performance of the most powerful members of this family, the shape memory alloy actuators." Similar to commercial thermally-driven shape memory alloys, graphene oxide nanoribbon actuators could be used for various electrolyte-free artificial muscle applications. 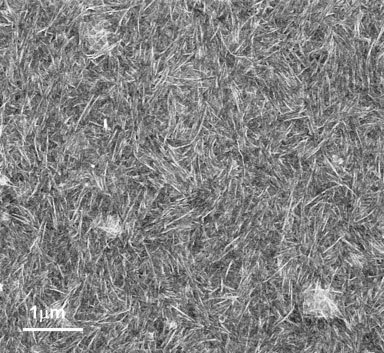 As reported, the experimentally derived work capacity of graphene oxide nanoribbon mats was quite substantial, about 40 J/kg and limited by the strength of prepared mats. "Assuming that graphene oxide nanoribbon mats can withstand higher maximum load and the generated strain remains independent of applied stress, the work capacity for graphene oxide nanoribbon actuators might reach 1000 J/kg or higher values," says Kozlov. "Alignment of nanoribbons in macroscopic samples should provide additional improvement in the strain generation and corresponding increase in the work capacity. As a result, the work capacity for graphene oxide nanoribbon mats may eventually approach extreme values reported for the shape memory alloys actuators. Optimization of mat preparation conditions is a factor responsible for reaching such high values."